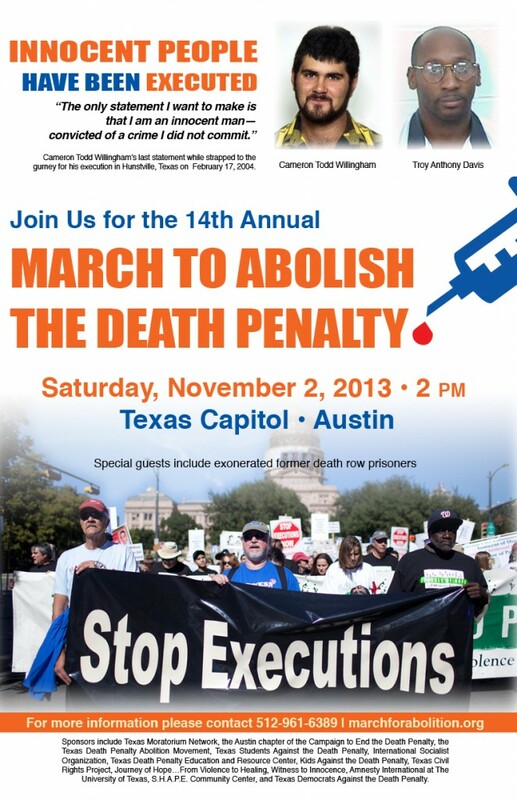 This Saturday, November 2, 2013, is the 14th Annual March to Abolish the Death Penalty in Austin at the Texas Capitol at 2 PM on Saturday. Meet on the South Steps of the Capitol. We will march through the streets of downtown Austin with a stop in front of the Texas Governor’s mansion and return to the Texas Capitol. The march will be led by several exonerated death row survivors from Witness to Innocence who each spent many years on death row waiting to be executed for crimes they did not commit. They made it out of the system alive, but there are many innocent people still on death row and other innocents who did not make it out alive. Speakers at the march will also include family members of people currently on death row, family members of murder victims who oppose the death penalty, community leaders, faith leaders, activists and others. We represent a growing number of people across Texas and the nation who oppose the death penalty. To learn more about the event, visit http://marchforabolition.org/ or Texas Moratorium Network.